Before the new landscape went in, piles of sandstone boulders—all unearthed during site preparation for the home—populated the lot. 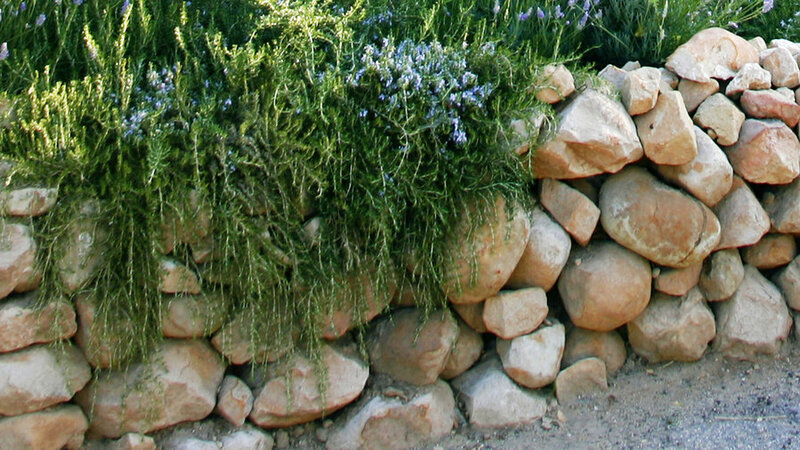 Grace incorporated the boulders into the garden, using them to form gentle mounds and swales that help prevent storm-water runoff, and to build walls. 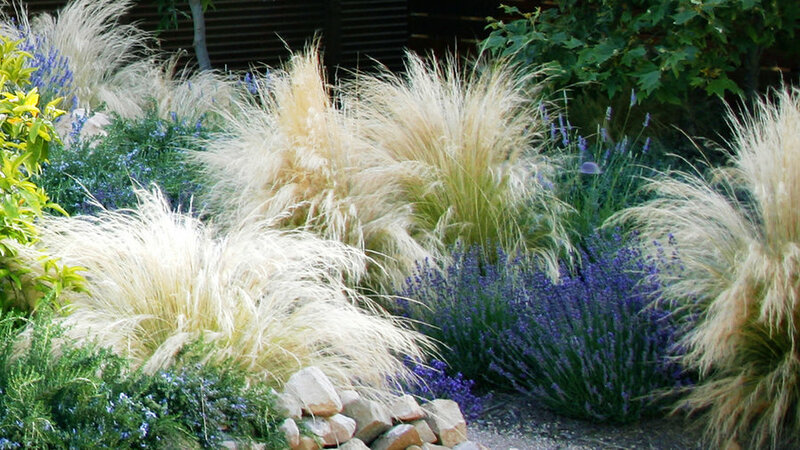 Then she chose mounding shrubs and soft grasses, which are watered by a seasonally adjusted drip-irrigation system. Paths are permeable. of the year, the irrigation is turned off for everything but the fruit trees. 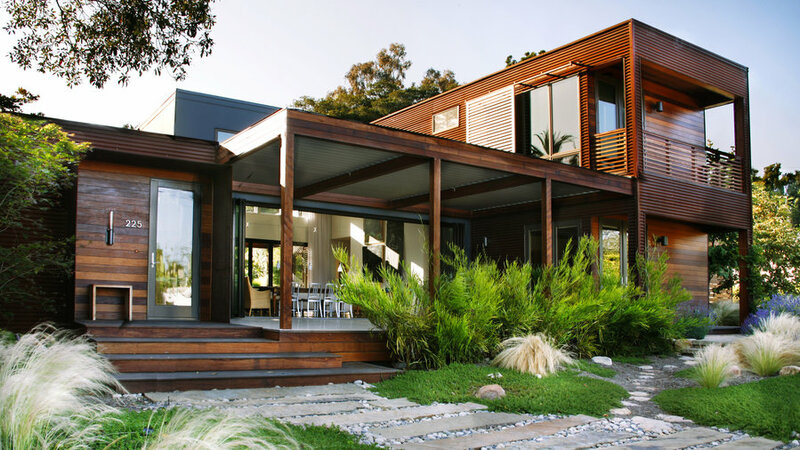 DESIGN Garden: Margie Grace, Santa Barbara; gracedesignassociates.com. 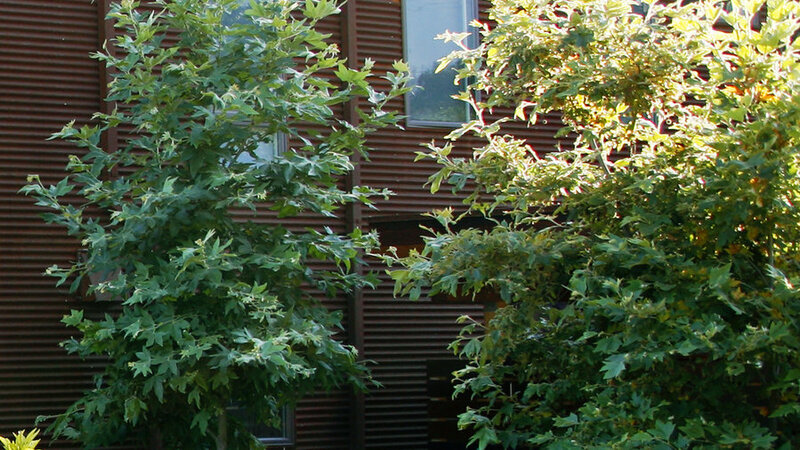 Home: Michelle Kaufmann, Novato, CA; michellekaufmann.com. Rich green Myoporum parvifolium carpets the area closest to the front door. Native to Australia, it grows 3 to 6 inches tall and spreads to 9 feet, but doesn’t stand up to foot traffic. 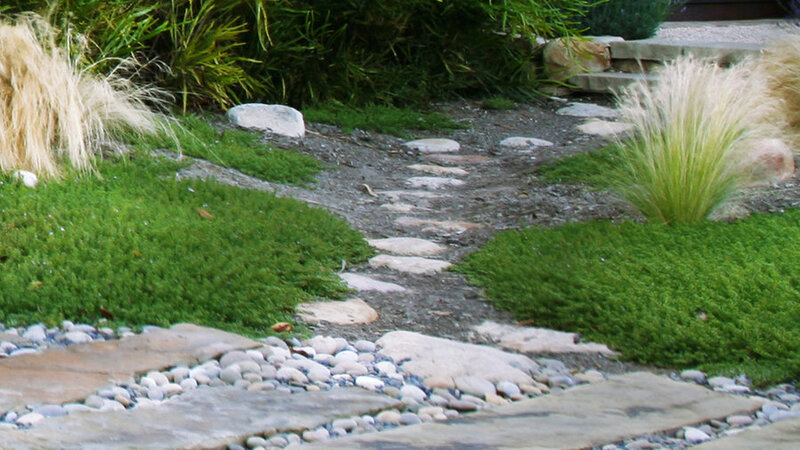 Stone slabs with Mexican beach pebbles between them create a wide, sinuous path to the front door. Prostrate rosemary (Rosmarinus officinalis ‘Irene’) spills over the low sandstone wall. Nearby, ‘Hidcote’ and ‘Munstead’ English lavender pump out wands of fragrant blooms in late spring. 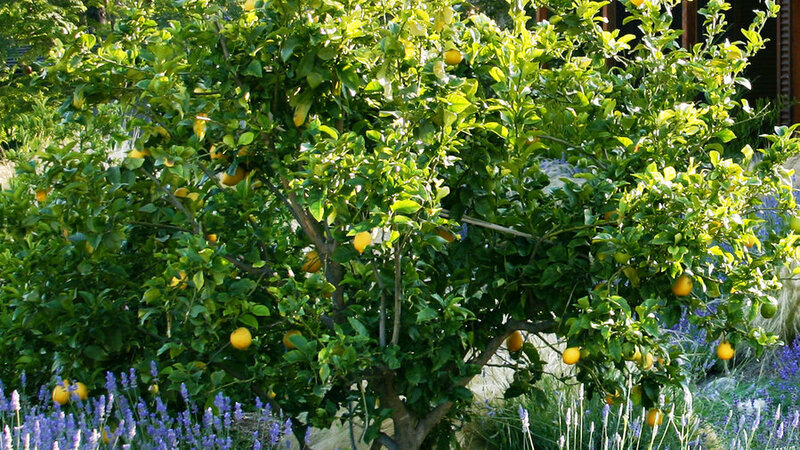 Lemon trees (and a small lime tree, nearby) need more water than the other plants; they’re on their own irrigation schedule. 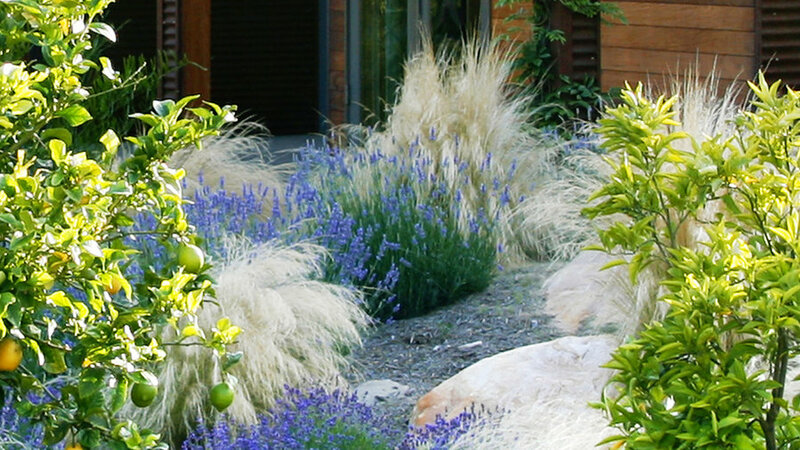 Pockets of the 25- by 80-foot front yard are unplanted, reducing the total area needing water. 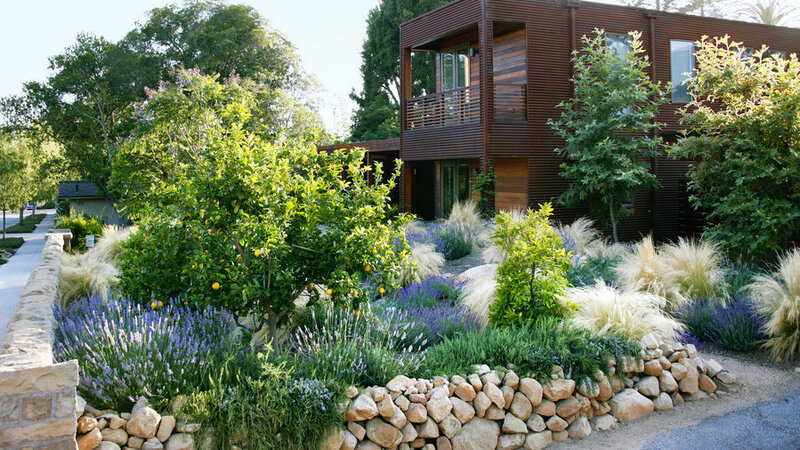 Grace dressed them with California Gold gravel, then topped them with sandstone boulders. 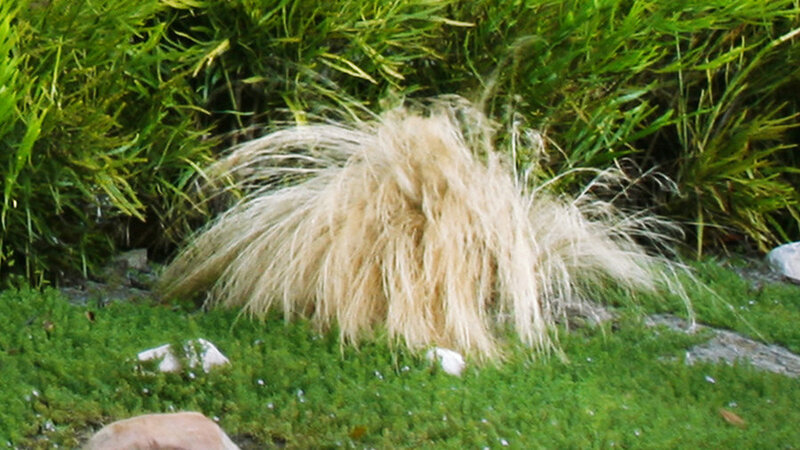 Blond Mexican feather grass dances in breezes. 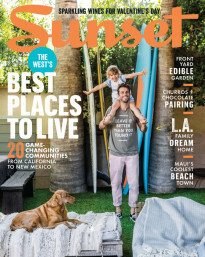 Near wild land where it’s a weedy nuisance, try similar Slender Veldt Grass (sold as Pennisetum spathio­latum)—“the closest I’ve found to it,” says Grace.